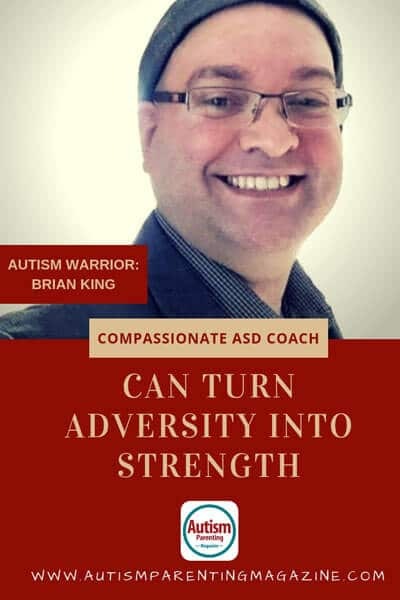 As a coach, professional workshop facilitator, and keynote presenter, Brian is celebrated for his story of resilience in the face of learning and physical disabilities to become a #1 best-selling author and successful entrepreneur. Brian survived cancer when he was 18 and lives with Asperger’s syndrome, ADHD, dyslexia, hEDS, and multiple sclerosis. With an emphasis on mindfulness and self-compassion, Brian said he uses a Zen-inspired approach to help individuals living with ADHD or autism spectrum challenges to find the quiet inside the storm of their minds and their lives. Brian calls himself Resilience Hacker—helping people turn any adversity into personal or professional adrenaline. He provides compassionate parent coaching and keynote presentations on relationship success for those with ADHD or Asperger’s syndrome. Location: Lives in DeKalb, Illinois and works with clients around the world using video and text-based coaching. Accomplishments: Brian grew up with undiagnosed ADHD, Asperger’s syndrome, and dyslexia. “In spite of not knowing any of this I managed to get a masters degree in social work and write five books including a #1 bestseller,” he said. “I live daily with challenges of these diagnoses in addition to hEDS and multiple sclerosis. I do this with an optimistic attitude, a solution-focused approach to life and an unwavering belief in the potential of others to overcome anything life brings their way,” Brian said. Brian counts his three sons—all of whom have ADHD and Asperger’s syndrome—as his greatest accomplishments. Inspiration: “When I look into the world and see all of the suffering I ask myself, ‘What can I and must I do to help make things better?’ Of course, I’m drawn to the ADHD and autism communities because their needs hit so close to home,” he said. Brian said he is reminded every day that his boys look to him to show them how to live a successful life with all of these challenges. “Which means, I must be able to model all of the possibilities instead of all the limitations,” he said. “I cannot and will not be a hypocrite! I realize that the skills I learned to manage my own challenges can be taught to them with greater credibility because I’ve used them first and experienced results,” Brian added. Goals: Brian said he wants to show as many people in the ADHD and autism communities that their conditions do not condemn them to a life of anguish, loneliness, and exclusion. “But they must realize, preventing these things requires a great deal of internal work that few people are willing to do, unfortunately. Please know, the results are within your reach,” he said. Advice for families affected by autism: “Asking for help is the best thing you can do for yourself and your family. It’s too easy to become isolated when you believe people don’t understand. Believe me when I tell you, finding your support community is essential to your long-term success individually and as a family.